Showing results for tags 'michael kopech'. 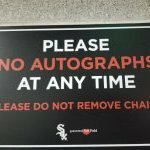 Kopech vs. Cubs Saturday? UPDATE: Nope. Some reputable Sox twitter personalities (Bilek, WSD) are hinting at something big for Saturday. Gonna be Kopech vs. Cubs? Also, Kopech scratched from Thursday start in Charlotte. Smoke...fire.